Canada’s WestJet Airlines delivered strong financial results for 4Q2014 and CY2014 driven by healthy revenue growth, and some benefit from falling fuel costs. Although the weaker CAD against the USD diminishes some of the benefit for Canadian airlines of lower fuel expense. As it moves fully into 2015 WestJet admits to seeing some pressure in its southern markets, particularly the Caribbean and Mexico, from capacity increases that are outstripping what it characterises at still healthy demand in those regions. Similar to some of its US peers, WestJet is projecting 1Q2015 unit revenue growth of flat to slightly negative, likely driven in part by some pricing pressure created from the capacity expansion in some winter destination markets. The airline is not offering guidance as to when unit revenues may start an upswing, but feels reasonably confident about overall demand, and has no plans to change its growth targets. WestJet recorded a nearly 34% increase it its 4Q2014 profits to CAD90.7 million (USD73.2 million) and increased CY2014 net income by 5.7% to CAD284 million (USD229.1 million). Excluding an after tax non-cash loss of CAD33 million (USD26.6 million) related to the sale of 10 older Boeing 737 jets to Southwest, WestJet’s full year profits were CAD317 million (USD255.7 million). During 4Q2014 WestJet increased its revenues by 7.3% to CAD994 million (USD801.9 million) while operating expenses increased by 3.6% to CAD854 million (USD688.8 million), which resulted in the company’s operating profit increasing from CAD102 million (USD82.3 million) to CAD140 million (USD112.9 million) year-on-year. For FY2014 WestJet’s operating revenues increased 8.6% to roughly CAD4 billion (USD3.2 billion) and operating expenses grew 7.3% to CAD3.5 billion (USD2.8 billion), helping to lift operating profit to CAD399 million (USD321.8 million) to CAD475 million (USD381.3 million). 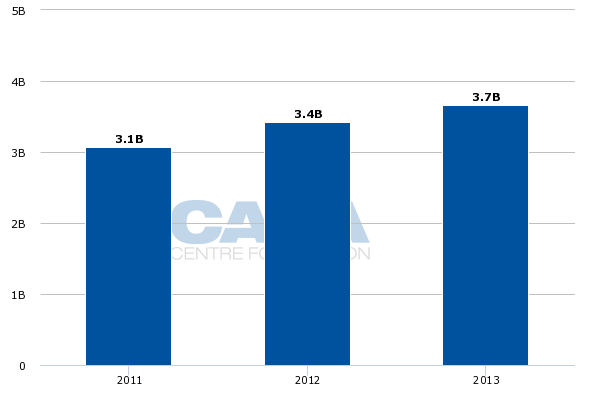 Its FY2014 rise in operating revenues was an improvement over the 6.9% growth recorded in CY2013, but not as strong as the year-on-year increases of 11.6% in CY2012 and 17.8% in CY2011. WestJet’s increase in CY2014 operating costs was slightly higher than the 6.9% rise it recorded in CY2013, and an improvement over the increases of 8.4% and 16.5%, respectively, in CY2012 and CY2011. On a unit basis, WestJet recorded a 0.7% rise in yields during 4Q2014 and flat revenue growth. 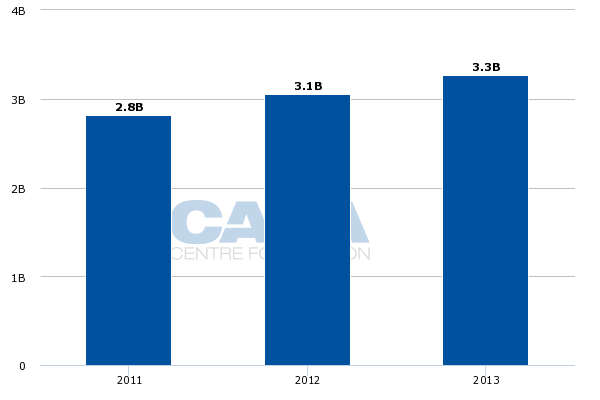 For CY2014, yields increased by 2.1% and unit revenues grew by 1.7%. Company executives remarked that during 4Q2014 there was a 2% degradation in unit revenues on WestJet’s Boeing 737s and a 2% unit revenue increase on its Q400 fleet. WestJet EVP of sales, marketing and guest experience Bob Cummings recently remarked to analysts and investors that this was “probably a good trend to give you a good feel for how the two fleet types work together”. 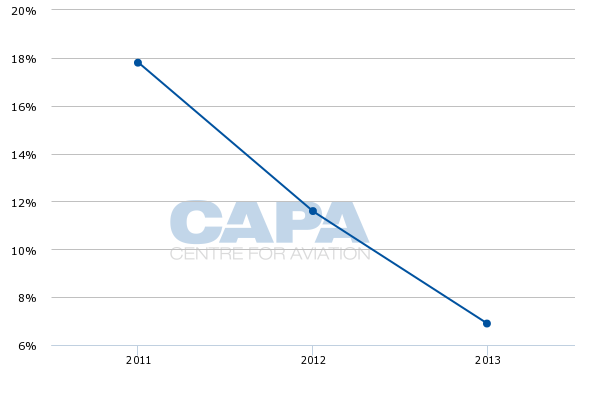 CAPA’s Fleet Database shows that as of 5-Feb-2014 Encore has a fleet of 16 Q400 turboprops, which is scheduled to grow to 25 by YE2015. WestJet mainline has a fleet of 108 Boeing narrowbodies, and is planning to take delivery of 12 737-800NGs in CY2015 and dispose of five 737-700NGs in 1H2015. It is also introducing four 767 widebodies into its fleet. Mr Cummings remarked the unit revenue decline on the Boeing narrowbodies was driven by longer stage lengths and capacity pressure on some of WestJet’s southern routes. WestJet CEO Gregg Saretsky stated that overall demand is good in all geographies, but one difference is the increase year-on-year in capacity on some of WestJet’s international routes into Mexico and the Caribbean. He remarked that CanJet and other competitors have added capacity into some southern routes, but stated that the additions were not unanticipated. Mr Cummings stated that industry ASMs to Mexico and the Caribbean are up nearly 11% in 1Q2015, and with that type of increase, WestJet is seeing some pricing and margin pressure in those regions. 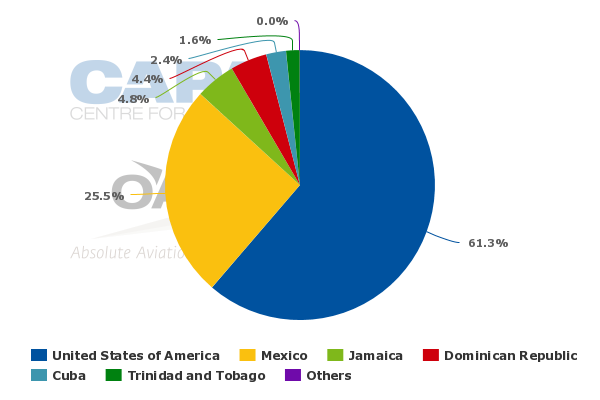 Data from CAPA and OAG for the week of 2-Feb-2015 show a roughly 26% rise in seats deployed between Canada and the Caribbean year-on-year, with Air Canada and Sunwing each posting a roughly 15% increase. WestJet’s seat numbers have grown by almost 5%. Air Transat has posted the largest rise at nearly 54%. Seats from Canada to Mexico have increased 8.4% year-on-year. Air Canada has recorded a 3.6% increase, WestJet’s seat numbers have grown 7% and Air Transat has recorded a roughly 24% rise. 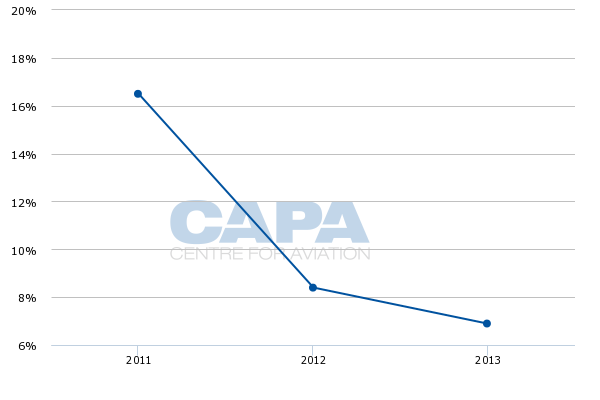 Data from CAPA and OAG for the week of 2-Feb-2015 to 8-Feb-2015 show that the bulk of WestJet’s international ASMs – 61%– are deployed to the US. Roughly 25% are allotted to Mexico, nearly 5% to Jamaica and 4% to the Dominican Republic. WestJet enjoyed some benefit from the decline in fuel prices during 4Q2014 as its top-line fuel expense dropped 6.4% year-on-year to CAD244 million (USD196.3 million). Some of the decline was partially offset by the weaker CAD against the USD as the average cost of jetfuel in Canadian currency was CAD114, down from CAD130 the year prior, a 12.5% decline. Illustrating the effects of the weaker CAD, WestJet noted that fuel costs in the USD during 4Q2014 was USD101 per barrel compared with USD124 the year prior, a 18.5% decline. Using current fuel prices and an average currency exchange rate of CAD1.23 to the USD, WestJet estimates fuel prices of USD67 per barrel for 1Q2015. Jet fuel prices are denominated in USD, but WestJet purchases them under the CAD, and company CFO Vito Culmone estimated that for Canadian airlines compared with their US counterparts the foreign exchange devaluation mitigates drops in West Texas Intermediate prices by about one-third. WestJet opted to stop fuel hedging a couple of years ago, and does not have any plans in the near term to resume hedging against fuel price fluctuations or drastically reducing fares as a result of lower fuel prices. WestJet is sticking to previous guidance of system wide capacity growth of 4%-5% in CY2015, which is down from an increase of 6.7% in CY2014. It has slightly revised its unit cost projections excluding fuel and profit sharing upwards in CY2015 from 2% to 3% to 2.5% to 3.5% driven by the weaker CAD against the USD. As WestJet faces some cost headwinds in CY2015, its fundamentals remain solid, including an adjusted net debt to EBITAR as of YE2014 of 1.43. It is also raising its dividend payment by 17% for a Mar-2015 payout, the fifth such increase since 2010. Obviously WestJet’s unit revenue and costs forecast are not heading in a favourable direction. But it faced currency pressure throughout much of CY2014 and still recorded solid profits, and has remained profitable during the last decade when it faced more trying times. Its odds of continuing that streak in CY2015 seem favourable.